Only yesterday, I gave a recap of Podcast Movement 2017 held last week in California. 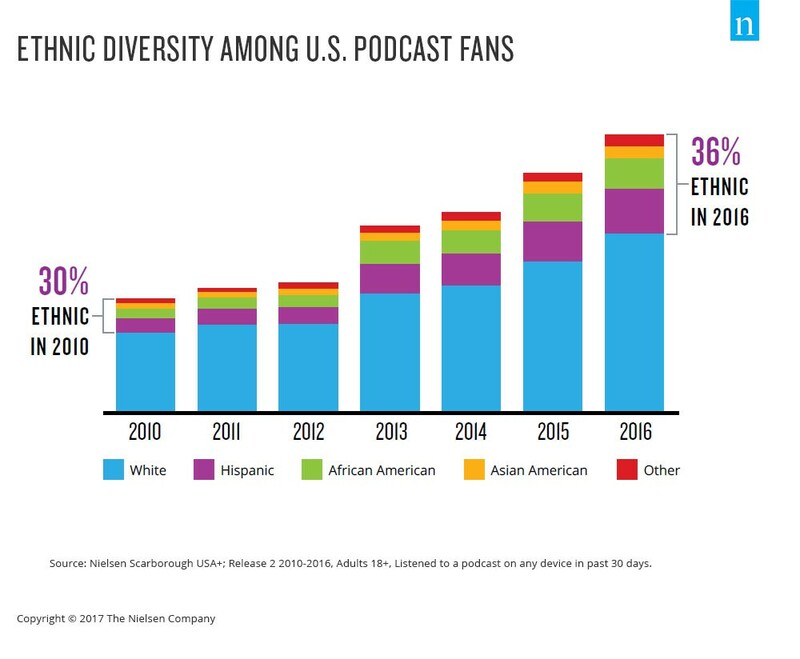 One of the points addressed my observation that the podcasting industry APPEARS to be fairly diverse. That’s based on a well-known management technique called “walking around” plus an above-average amount of podcast sample listening. Podcasting audiences now mirror the Census ethnic statistics. I suspect this is true because podcasters don’t really care. A fan of their podcast is a FAN! They just put out the best content they can — communicate the message they want people to hear — and let the chips fall where they may. The cumulative podcasting “message” must be pretty good since it isn’t drawing an audience different than the total population. Podcasting, as a medium, speaks well enough to appeal to an audience made up of an ethnically-representative slice of the country. Not by plan, not by mandate. Through a natural appeal between personal content created and content personally consumed. The medium has very few barriers to entry, so it isn’t naturally skewed toward those with access to, say, a radio station or newspaper to “get the word out” (or the money to USE those large resources). Today, one can become a podcaster with as little as a smartphone for equipment. People bandy the word “democratic” about frequently, often wrong. Podcasting is democratic in the very best sense of the word. Despite the industry being 10+ years old, certain newcomers are enjoying a sense of fresh discovery (remember that?) — seeing “flaws” to fix — without a firm understanding of the history of the medium. Part of the human condition is to continually look at “things” as something to “fix”… but that’s another story. My point is that SOME express concern about diversity in podcasting… unnecessarily, IMHO. The podcasting space has “evolved” into, perhaps, the medium leading the way to openly accept others… their right to free speech… and the fact that podcasters really DON’T COMPETE with each other to the extent they are sailing in the same ship together. This discussion does not include PODCASTERS themselves… no idea what the racial makeup is but, based on PM17, it feels diverse. Plus the listening audience, which is “balanced,” doesn’t have any problem with the “ethnic source” of their content. So, can we just not worry TOO much about this? I would just ask all podcasters to FOCUS on making a GOOD podcast, that’s something you can control. Why do I offer this suggestion? ME getting your good pod.